You have two different options when creating menus. One is to simply add items to the default menu available in every template. The other is to create a custom menu that pops up when needed. Every template has a default menu button. The position of this button varies between templates, and can not be removed from the template. The default menu is initially empty except for an "Exit Your App Name" button. Items can be added to the menu at the root level or to a submenu. It is important to note that a submenu can only be one level deep. 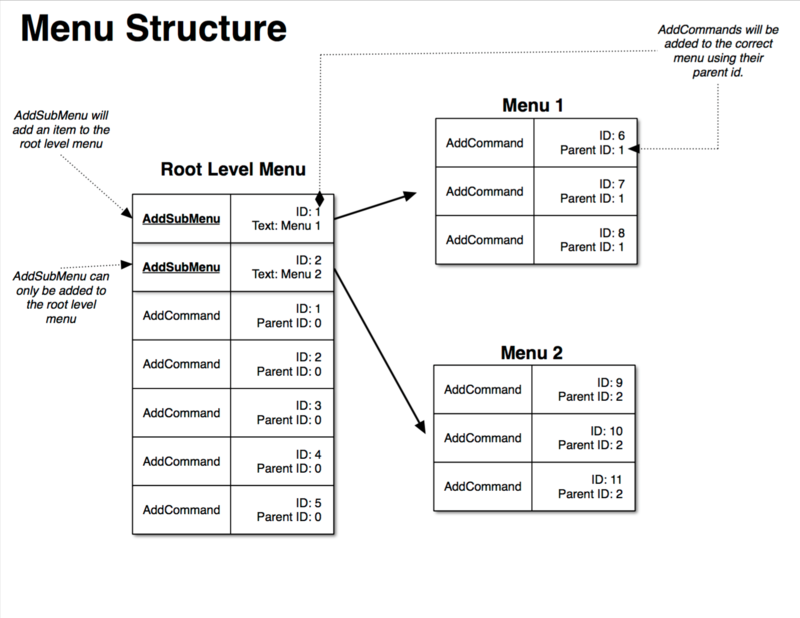 The AddCommand RPC can be used to add items to the root menu or to a submenu. Each AddCommand RPC must be sent with a unique id, a voice-recognition command, and a set of menu parameters. The menu parameters include the menu name, the position of the item in the menu, and the id of the menu item’s parent. If the menu item is being added to the root menu, then the parent id is 0. If it is being added to a submenu, then the parent id is the submenu’s id. To create a submenu, first send an AddSubMenu RPC. When a response is received from the SDL Core, check if the submenu was added successfully. If it was, send an AddCommand RPC for each item in the submenu. Use the cmdID of the menu item to tell the SDL Core which item to delete using the DeleteCommand RPC. Use the menuID to tell the SDLCore which item to delete using the DeleteSubMenu RPC. Custom menus, called perform interactions, are one level deep, however, you can create submenus by triggering another perform interaction when the user selects a row in a menu. Perform interactions can be set up to recognize speech, so a user can select an item in the menu by speaking their preference rather than physically selecting the item. Perform interactions are created by sending two different RPCs. First a CreateInteractionChoiceSet RPC must be sent. This RPC sends a list of items that will show up in the menu. When the request has been registered successfully, then a PerformInteraction RPC is sent. The PerformInteraction RPC sends the formatting requirements, the voice-recognition commands, and a timeout command. Each menu item choice defined in Choice should be assigned a unique id. 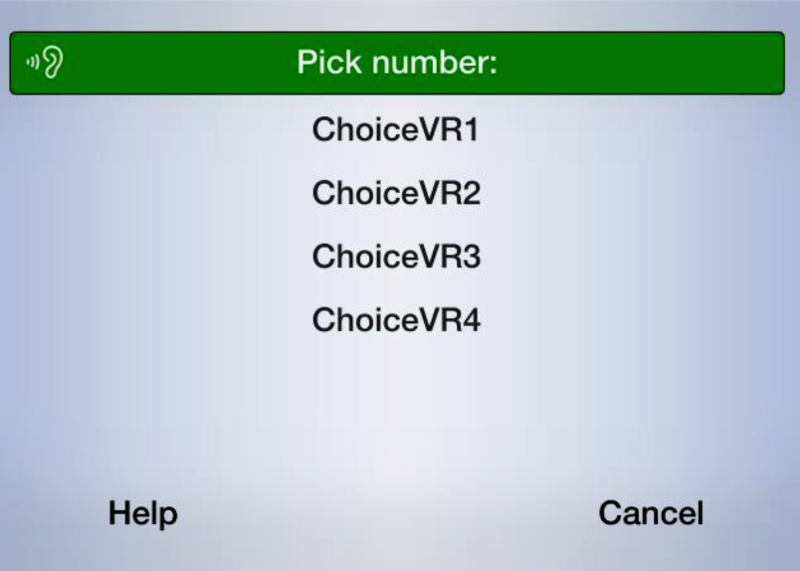 The choice set in CreateInteractionChoiceSet should also have its own unique id. Once the set of menu items has been sent to SDL Core, send a PerformInteraction RPC to get the items to show up on the HMI screen. The interaction mode specifies the way the user is prompted to make a section and the way in which the user’s selection is recorded. The items in the perform interaction can be shown as a grid of buttons (with optional images) or as a list of choices. Keyboard is currently only supported for the navigation app type. A text-to-speech chunk is a text phrase or prerecorded sound that will be spoken by the head unit. The text parameter specifies the text to be spoken or the name of the pre-recorded sound. Use the type parameter to define the type of information in the text parameter. The PerformInteraction request can have a initial, timeout, and a help prompt. The timeout parameter defines the amount of time the menu will appear on the screen before the menu is dismissed automatically by the HMI. If the information in the menu is dynamic, then the old interaction choice set needs to be deleted with a DeleteInteractionChoiceSet RPC before the new information can be added to the menu. Use the interaction choice set id to delete the menu.